The rotating service structure was retracted on Wednesday night starting around 8 p.m. Feb. 23 over about 25 minutes under a light fog. In a major milestone, the External Fuel tank has been successfully loaded with 535,000 gallons of liquid hydrogen fuel and liquid oxygen to power Discovery’s three main engines during the 8 1/2-minute climb into orbit. A dangerous leak of gaseous hydrogen is what caused the launch scrub last Nov. 5. Pumps will continue to trickle propellants into the tank to replace the small amounts that evaporate during the countdown. It’s an absolutely gorgeous day here at KSC with clear blue skies, calm winds and a crackling excitement that permeates the air for everyone here for the launch. The weather forecast has been upgraded to 90% GO from 80% yesterday which was cloudy and overcast. A few low lying clouds are the only concern. 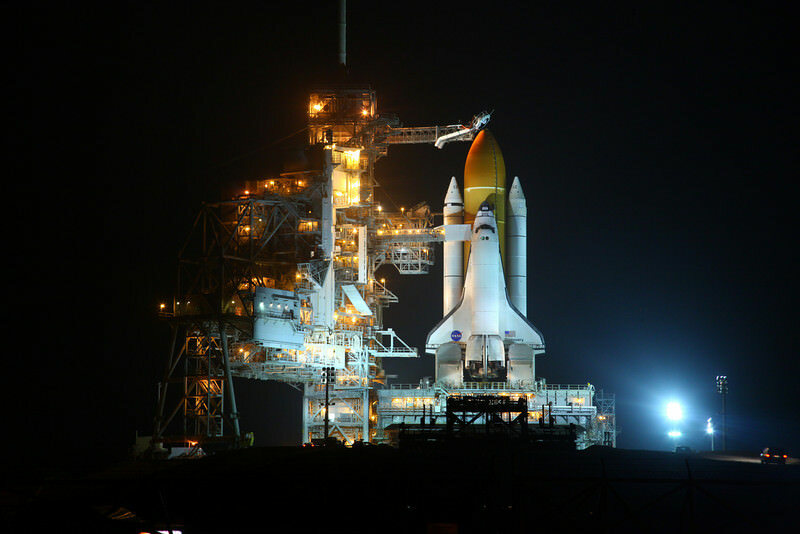 Large public crowds have gathered at public viewing areas along Florida’s Space Coast. The hotels are full of folks excited to see the historic final launch of Discovery on its 39th and final mission. The Johannes Kepler ATV is due to dock at the ISS at about 12 noon. A successful docking is an essential prerequisite to clear Discovery for liftoff. The countdown clock is ticking down towards the final blastoff of Discovery. The veteran crew of five men and one woman led by Shuttle Commander Steve Lindsey arrived on Sunday on a wave of T-38 jets. The primary goal of the STS-133 mission is to deliver the “Leonardo” Permanent Multipurpose Module to the ISS. The R2 Robonaut is packed Inside Leonardo along with science equipment, spare parts, clothing food and assorted gear. The twin brother of R2 is on hand at KSC to watch his brothers launch. 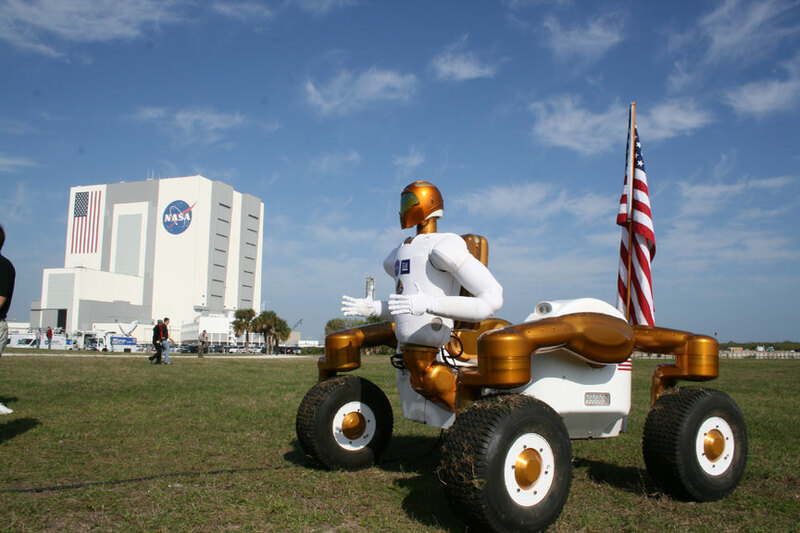 He also sports a fancy new set of wheels patterned after the rocker bogie system of NASA’s Mars rovers Spirit and Opportunity.